We cruise along Lockhart’s red-light strip with its seedy pubs and girlie bars. Punters spill out onto the sidewalk. A group of teenagers wobble, high heeled and tipsy, amidst traffic. They stop for selfies. ‘I pick up drunks. Weirdos. I’ve had some come in and lay on the floor. I get angry passengers (hai hak 鞋客) too, but they just don’t know any better. Of course us pros know the roads better than they do. I’m a really fast driver and yet riding in my cab is super comfortable. The way I drive is steady. People have praised me for that. They say my service is good. 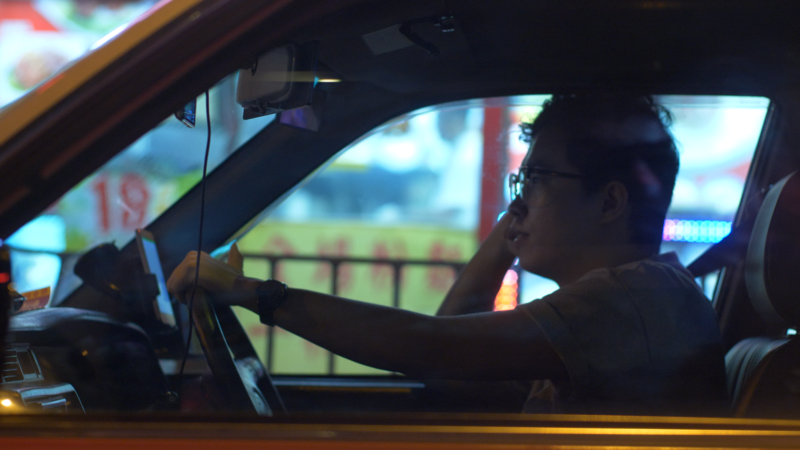 It makes me happy to hear these things.’ We can confirm that Ah Wai, while fast and adept at weaving through traffic, keeps an even pace and never takes corners too sharply. 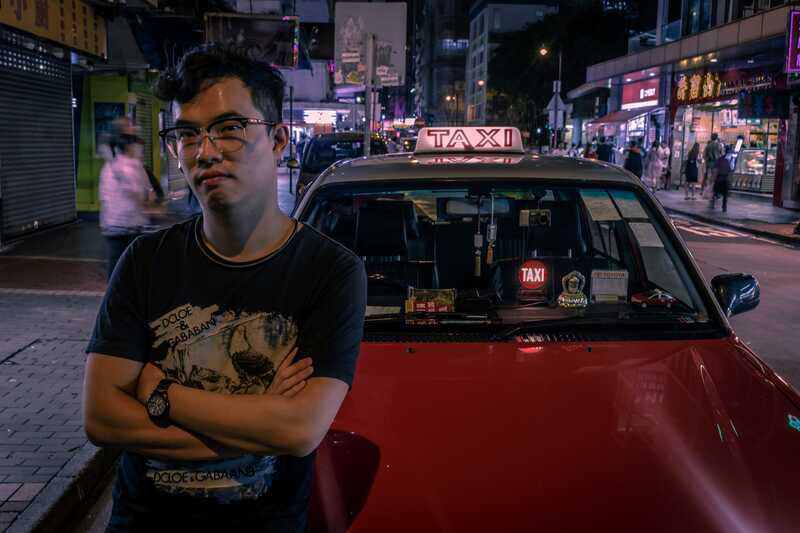 Ah Wai’s nocturnal nature hasn’t interfered much with his social life: ‘People think you lose all your friends, being a night owl, but my pals come out to meet me at 24-hour joints. 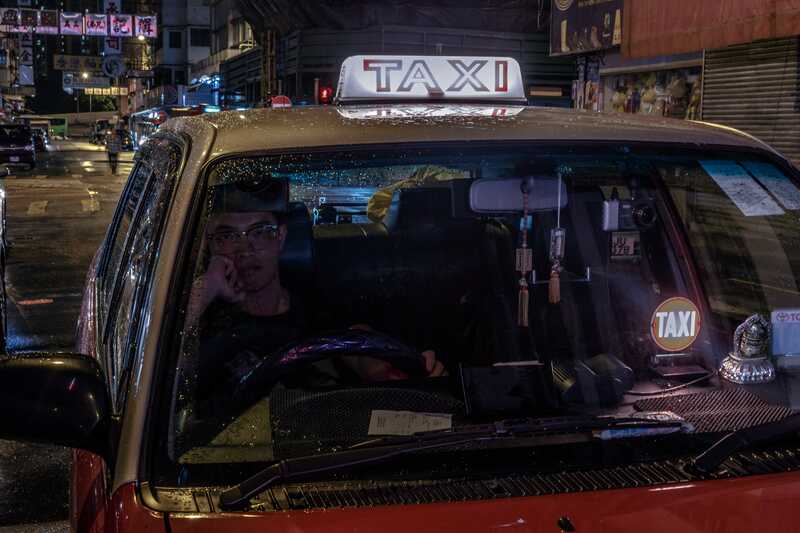 After all, when everyone else eats, we get a break too – those are the quiet hours when there are fewer passengers.’ We ride past packed cha chaan tengs and dai pai dongs lit in the murk like luminous bubbles, but these are not the haunts of the night shift driver. 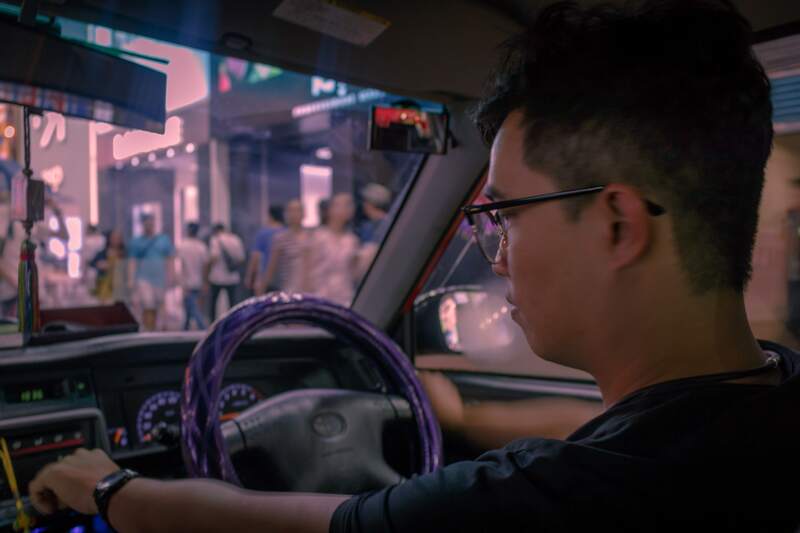 For that we must ‘strike the gong’ (go to Causeway Bay, da lo, 打鑼) and cross the harbour or dive (chihm seui 潛水), as cabbies say. 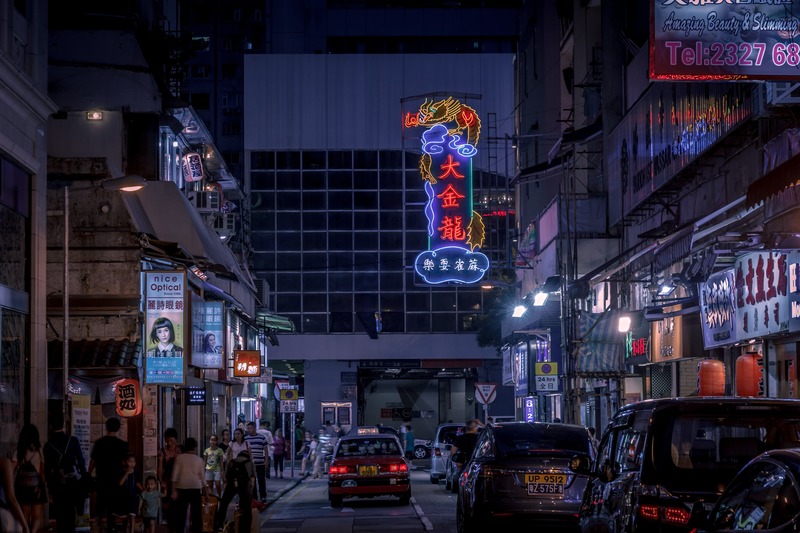 Ah Wai’s usual stomping grounds, Tsim Sha Tsui and Mong Kok, are still vibrant as midnight strikes. Temple Street Market, its massive gate darkened, has wound down, but the night is young on streets where neighbours eat, gossip, and carouse around folding tables set out on the sidewalk, like a communal living room. 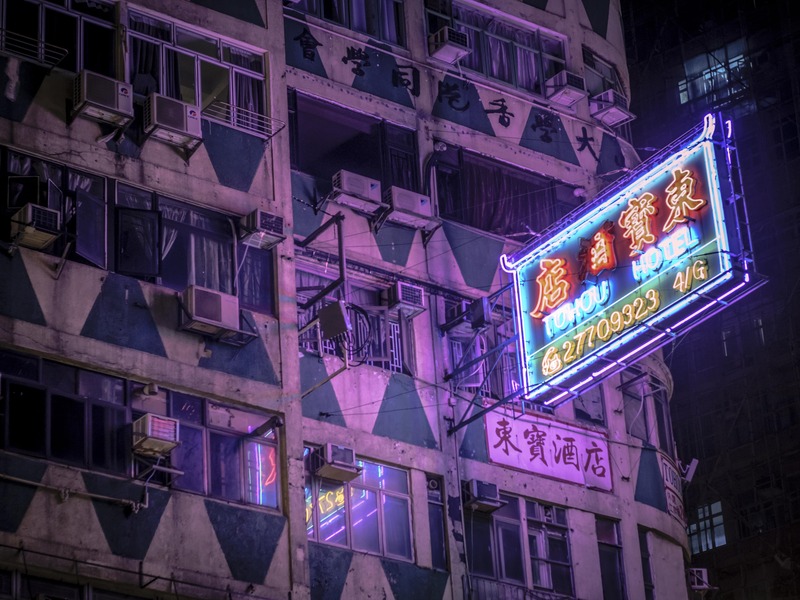 For those seeking closer intimacy, these streets are also clearly marked with hot pink fluorescent tubes. Under cover of night, the industrial area of Kowloon Bay is deserted and eerily quiet, but one flyover shelters a riot of red. 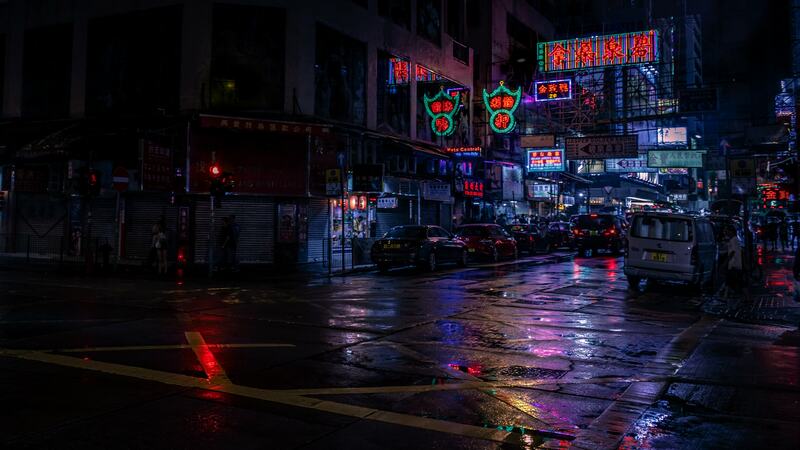 Taxis, awash with the scarlet glow of an after hours cafe, are triple parked around the block. A sudden blast of air conditioning and fluorescent light cuts through the muggy night as we push through the diner’s double glass doors. 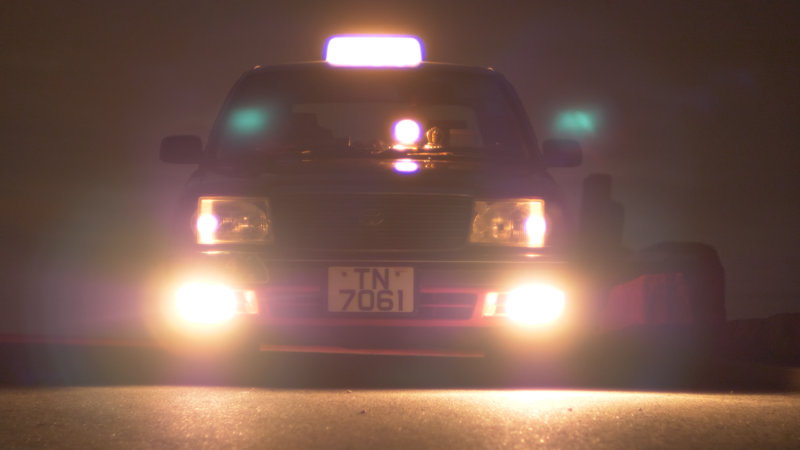 A loudspeaker calls out license plates, in a bored monotone, for cabs that need moving. We are seated at a booth in the back from where we espy the other nighthawks, poking at phones, gesticulating wildly, or slumped to the side French-inhaling smoke. One holds court at a booth across the room, one is dressed in a patterned purple poncho, while another throws his hands in the air and lets off three loud cries – “Waaah! Waaah! Waaaaaaaaaaah!”. 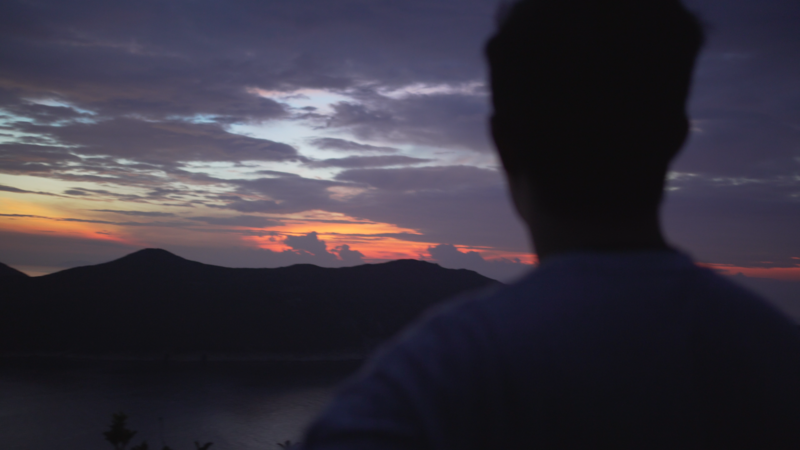 As we enter Sai Kung Country Park, the darkness encircles us. Leaving even street lamps behind, we watch for roaming cows. In the secluded country park we each take turns driving the cab – the steering doesn’t have much resistance and the suspension is spongy. A lever topped with a red knob to the right of the driver’s seat opens and closes the left passenger door. We stop by the side of the road and flick off the headlights for a moment. Inky black envelopes us. Swathed in shadow I am struck by the dual nature of darkness, its comforting embrace and the eerie menace of its abyssal void.